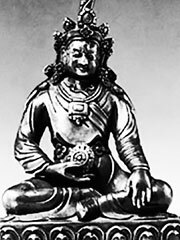 Chakravartin is a term used in India and in the Buddhist religion for a universal and just ruler. The original meaning derives from the dharma chakra or the wheel of dharma, and it can be understood to mean ‘he who turns the wheel (of dharma)’, thus he who maintains the universal law (dharma), which of necessity applies across the world. It may be understood to mean the ruler either of all of Bharatavarsha (roughly equivalent to the Indian subcontinent), or of the whole world. Among Buddhists, the term may be understood to apply to the Buddha, as a spiritual ruler. Sometimes it is understood to mean an ideal secular ruler, who rules by law in the secular world as the Buddha does in the spiritual world. In Hindu India, the term is used for the Maurya emperor Ashoka, and its use has not been generally accepted for any other historic figure. It occurs sometimes as a name in Hindu communities in India, especially in the east of the country.